We’ve lost another giant—maybe the last of his generation of Golden Age science fiction. Frederik Pohl, along with Clarke, Heinlein, and Asimov, occupied a central position in my formative years as a lover of science fiction. More than any of the others, he kept growing in maturity and ambition as a writer—showing a burst of enormous creativity in his late 50s, with two of his finest books, Man Plus (1976) and Gateway (1977). I consider Gateway one of the top five books in all of science fiction, and I’m not sure what the other four would be. I first encountered his work, I believe, in The Space Merchants, which he coauthored in 1953 with C.M. Kornbluth. (I didn’t read it in 1953; I was only four years old at the time. I started reading him in my teens.) I still have many old paperbacks of his earlier work on my shelf. Just scanning a list of his titles evokes all kinds of feelings of golden-age sense of wonder: Search the Sky, Gladiator-At-Law, Drunkard’s Walk (which I was especially fond of as a teenager because of the tastefully drawn naked woman on the cover), Starchild, Rogue Star, Turn Left at Thursday, Starburst, The Siege of Eternity, The Case Against Tomorrow…. And yes, the title of my own work in progress, The Reefs of Time, is a knowing echo of his The Reefs of Space. Pohl did just about everything there was to do in the SF world. He was an editor (Galaxy magazine), an agent, a solo writer, a collaborative writer, a futurist, a columnist and blogger, a president of the Science Fiction Writers of America, and a SFWA Grandmaster. He was also a perfect gentleman, and a fascinating speaker. I only met him once or twice, but he treated me, a fresh upstart, with graciousness and warmth. You can read more about his life and work at the New York Times and the Guardian. I hope he’s enjoying a perfect view of the stars from where he is right now, perhaps sitting around a table with some of the other departed greats, in the observation lounge of a heavenly starship. 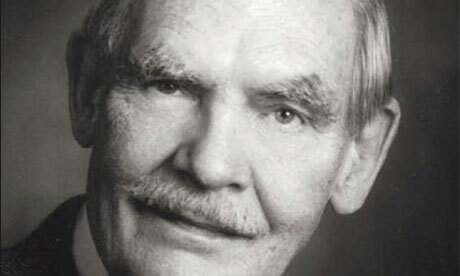 Godspeed, Frederik Pohl, and thank you for all of the visions. Although today is a sad and somber day, it is important to do just what you did–celebrate Mr. Pohl's contributions. He was truly one of the great science fiction writers and it warms my heart to close my eyes and imagine the scene you describe on a heavenly starship. He was coming up — six years short — on a hundred years. Kind of makes me smile to think of all the science fiction stories he was able to read at the time they were first published: single-shot short stories, serials, novels, "best of" anthology stories … There's something very heart-warming about a life spent embracing what you love. I just read of Fredrick Pohl's passing, 11/29/13 while researching Jeffrey's progress on "The Reefs of Time". I feel saddened that this great voice is no more. I rate his Gateway/Heechee series right behind Asimov's Foundation/Robot/Empire series. What a life he had and all of the Science Fiction he watched become Science Fact.